The Cessna 401 respectively Cessna 402 is a twin-engined six- to ten-seat light corporate and utility aircraft with retractable landing gear produced by the US-American manufacturer Cessna Aircraft Company. Cessna 401 and 402 are more economic developments of the Cessna 411, with less weight and less powerful engines. 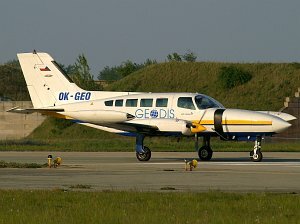 The total production numbers include 401 Cessna 401 and 1535 Cessna 402.